Thomas is a small town, but has several outstanding individuals that have a lot of energy to make trail work projects happen! 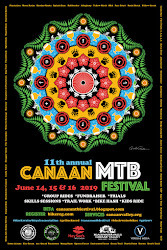 Please consider volunteering your time to do trail work on an organized trail work day or on sunday morning the weekend of the Canaan Mountain Bike Festival. Even though the festival headquarters are Davis, Thomas is our sister town. And there is great momentum with the community over there and the trails. You are invited to this celebration of their hard work. And remember when you come down for the Canaan MTB Festival, go over to Thomas and check out the trails and restaurants, art galleries and shops. Do you know your community created 5 miles of beautiful, clean, bridge-enhanced trails in Thomas?! It is awesome and you should come see it. Come celebrate the opening of the Thomas City Park Trails with a community potluck hosted by the North Fork Watershed Project on Friday June 1st! The event will mark the culmination of a two and a half year project to create a 5 mile long sustainable trail system in Thomas. 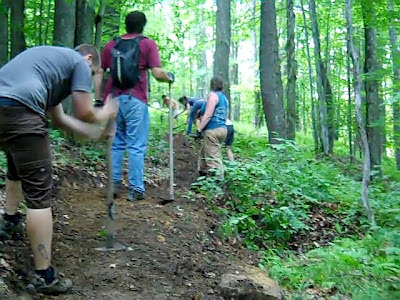 The fun will start at 5:00PM and will include guided hiking and mountain biking tours of the new trails, a ribbon cutting ceremony, a scavenger hunt for kids followed by a potluck at the pavilion around 7pm. The park is the first right after the bridge on 219 S if you are heading away from Thomas, towards Parsons. Join us at the pavilion down by the river and bring your family and friends along with you.